Christmas is just around the corner. It’s not long till December and once the 1st of December hits, it’s fast-forward all the way to Christmas Day. My annual internal debate has begun: Do I put up a Christmas tree or not. I have a collection of ornaments that I’ve purchased (and received as gifts) in various places over the years (all neatly catalogued as to where I was and who I was with) and they deserve an airing on what I’ve called my ‘travel tree’. But the question is, can I be bothered? Does the hassle of buying a tree and lugging it home outweigh the excitement of decorating it and the lovely memories that will come flooding back? Being superstitious adds to the complications as it’s ‘up by December 8th and down by January 6th’ with me and I won’t be in town on January 6th. Will that adversely affect my luck for the next year? Is it worth the risk? I tell myself that if I had children and could make a big deal of the decorating, then I’d be first in the queue to buy a tree. If I had kids I could borrow, I might also be tempted. If I had someone patient enough (and interested enough) to share my reminiscences, then perhaps I’d do more than just consider it. Right now though, the hassle factor is winning out. And, as I always do when faced with a major decision (major? shows just how complicated my life really is), I seek distraction. It seems that I’m never really on top of what’s happening and each year hear of something or somewhere that I’ve missed out on. So this year, I’ve been doing my homework and reading up on what’s on in Budapest over the holidays. What’s open and what’s closed. When everything is open and closed. Where the markets are. And I found it all in one place – everything from when the Santa train leaves to the times of the Advent Fair in Obuda. 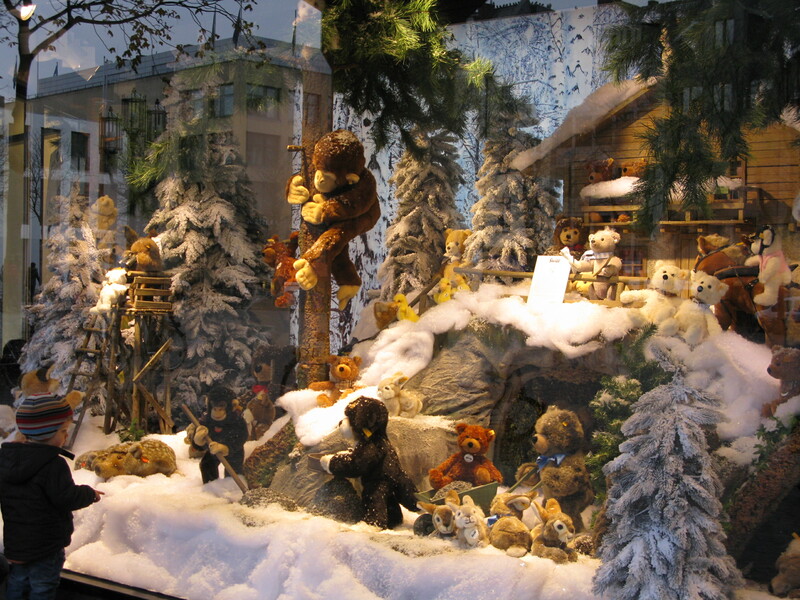 Written mostly Anna Sebestyen at TopBudapest.org, this site is well worth forwarding to any visitors you might have coming in over Christmas, and is also a good point of reference for what’s on in town. It’s certainly solved my problem: with so much going on, I won’t have time to get my tree – let alone decorate it. https://unpackingmybottomdrawer.com/wp-content/uploads/2017/06/logo-300x82.png 0 0 Mary Murphy https://unpackingmybottomdrawer.com/wp-content/uploads/2017/06/logo-300x82.png Mary Murphy2012-11-29 08:58:062016-08-10 11:42:13Christmas... again? When she died on her thirteenth birthday on St Patrick’s Day in 1887, Hungary mourned its loss. The nation’s flags flew at half-mast and Hungarians knew they would never see the like of her again. All around the world, those who knew her and knew of her, realised how truly amazing she had been. Kincsem was probably the most successful thoroughbred racehorse ever, winning all 54 races she started in. While she later became the toast of Europe, there was a time when she was passed over because she was too common looking. Legend has it that she went missing from home one night. She’d been running with 49 other horses on her owner’s estate and was by far the most ungainly. She turned up later with a band of gypsies. When her owner asked why they’d chosen Kincsem above the others, he was told that although the other horses might be better looking, she was the one who would be the champion. And she was. She won fifty-four races in five countries and was never defeated. 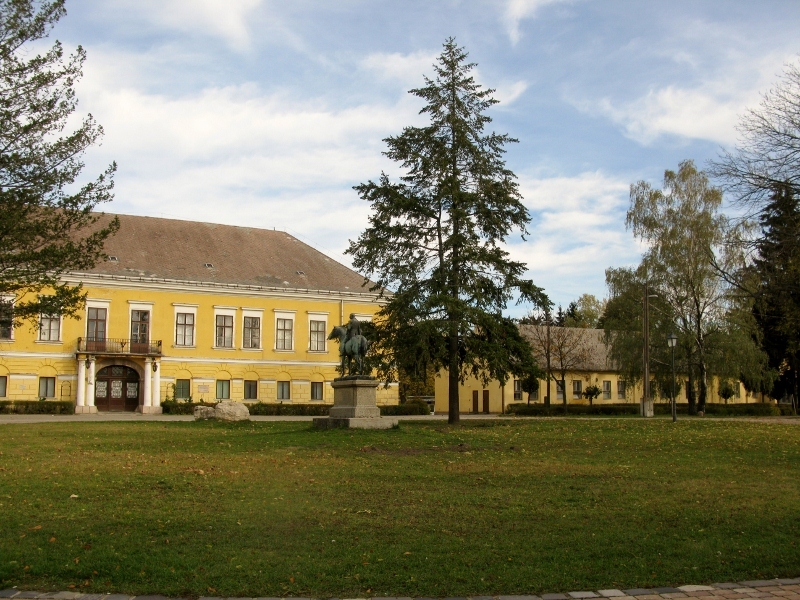 Kincsem was sired in Kisbér – a small town in northwestern Hungary that was once home to the Hungarian National Riding School. She was bred by Ernest de Blascovich, a young man in his 20s whose horses went on to achieve great things. 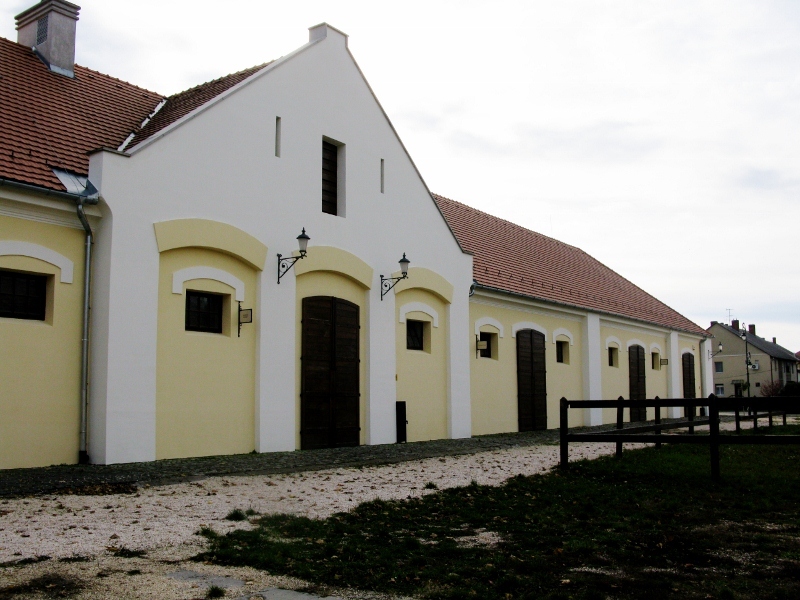 The town’s horsebreeding history kicked off in 1830, when the Battyány family started breeding imported English thoroughbreds and later established a military studfarm that was to become state property. 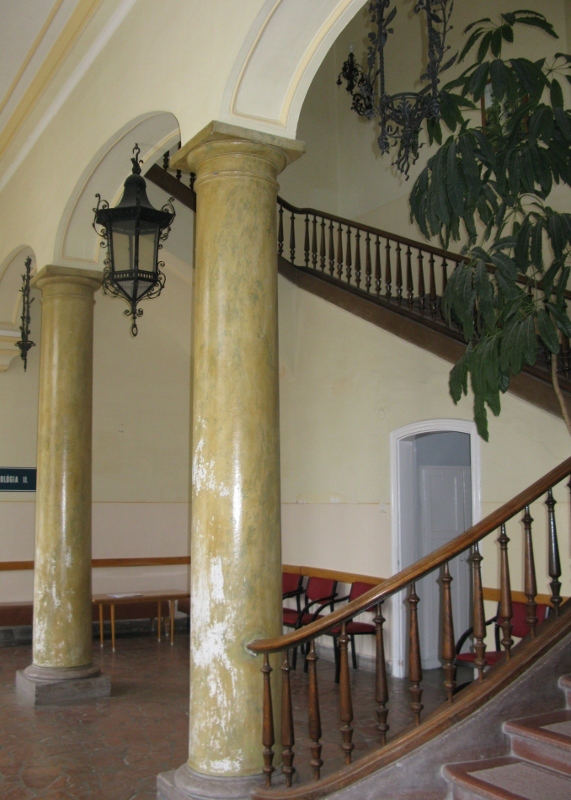 The old Battyány home was used till recently as a hospital and now stands empty. 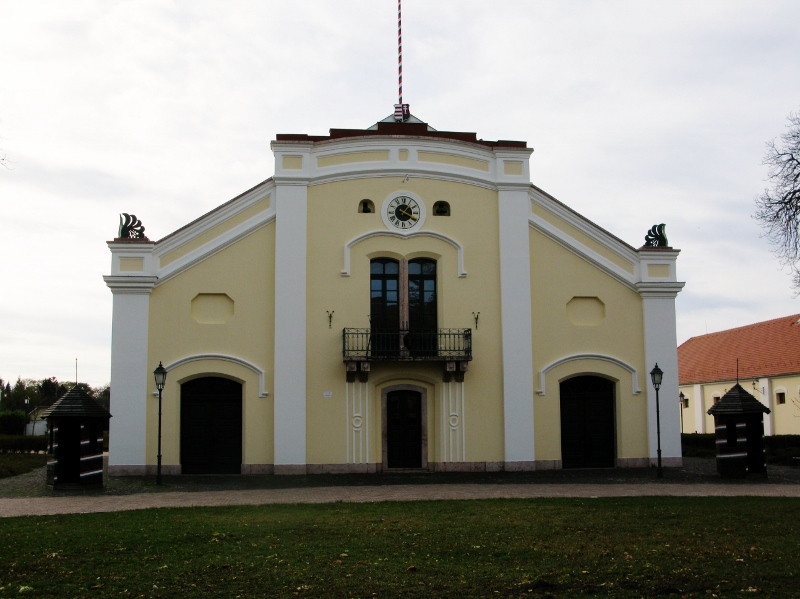 historic monuments, the largest of which is the recently renovated Royal riding hall, originally built in 1859 and in its day one of the largest covered riding schools in Europe. Sadly, it sits empty at the centre of what is called Ménesbirtok (studfarm) but is really a group of buildings that are crying out for a developer to continue developing. Millions 0f EU funding has already been spent and yet there’s an air of desertedness about the place. Yes, it was a Sunday afternoon in November, but what better time to visit a museum? A search of the Net yielded little so while the converted stalls are labelled Kincsem souvenirs, Huszar museum, etc., I found myself wondering what exactly lay behind those closed doors. White elephants perhaps? I’m a great fan of racing and like few things better than to while away an afternoon at the races. I grew up in Co. Kildare, home of the Irish National Stud, a county where racing is very much a part of life. I still have hopes of one day owning at least a leg of horse and feeling the pride that goes with entrance to the winners’ enclosure. I’d also like to go back to Kisbér to see the museum so if anyone has any details about opening times / events, please let me know. The traveler sees what he sees, the tourist sees what he has come to see. So said G. K. Chesterton many moons ago and althought he himself was not a man I’d have fancied in his day, that insight alone would have earned him a dinner invitation (if he brought Fr Brown with him). I’ve noticed that, more often than not, I come home from somewhere without having seen the sight. I rarely buy guidebooks and tend to rely on fiction set in the city to navigate my way around. Inspector Morse in Oxford, Commissario Brunetti in Venice, Spenser in Boston, Kate Shugak in Alaska – the list goes on. If anything, I have stronger feelings about what I don’t want to see than what might interest me. I didn’t visit the Van Gogh museum in Amsterdam until my fifth trip there (and then only because it was pelting down rain). 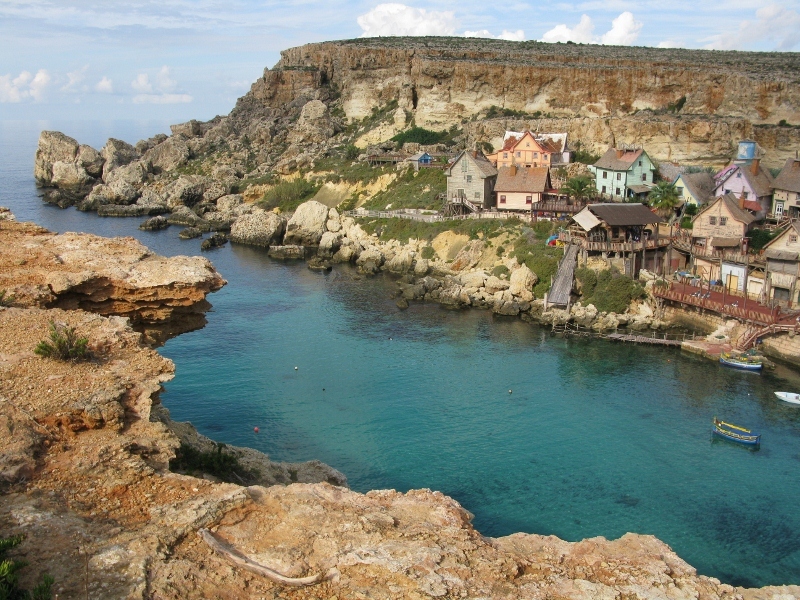 I’ve been going to Malta two or three times a year since 2010. It’s a small island and as my play time is limited, my list of things to do is still quite long. 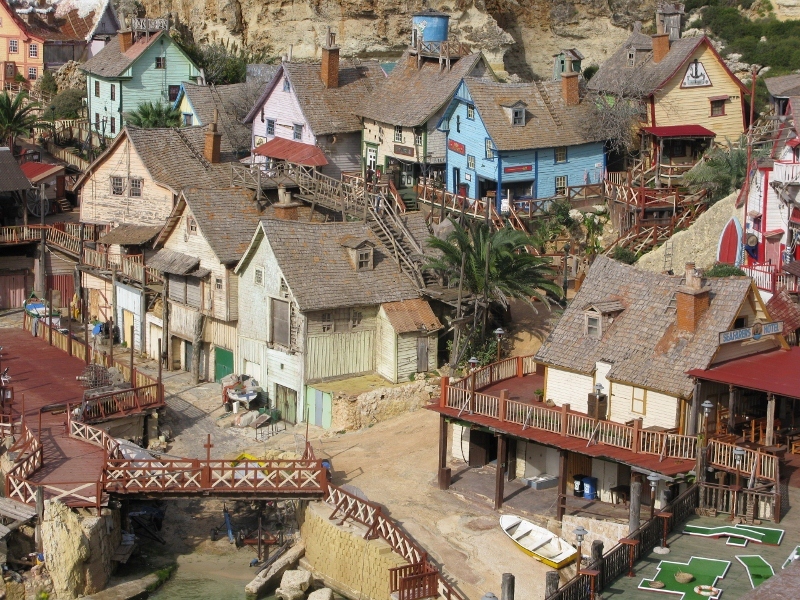 Had I to rank those places still to be explored, though, Popeye’s village – the set where the 1980 musical movie was filmed – would not have made the list. But life has a funny way of taking you to places you need to see, just when you need to see them. We’ d left St Julian’s hoping to make the 10.30 ferry to Gozo but got stuck behind a bus and another bus and another bus. Resigned to catching the 11.15, our intrepid guide, the inimitable SB, decided to detour to the village. She didn’t tell us where we were going until we were practically upon it by which time the child in me was already drooling at the wonder of it all. It was like looking down on another world. The voices of faceless children cut through the air. From our vantage point on the cliff above, everything seemed tiny. Positively Lilliputian. It was whimsical. Playful. Fanciful. For the first time in a while, I felt the joy of pure delight. Simple, uncomplicated emotion, reacting to nothing other than what I saw. Innocent amazement. It gave me pause for thought. Our lives are way more complicated than they need to be. Our relationships, too. Our expectations have lost all sense of proportion. We’ve forgotten the simple joy of contentment. Our days are harried – targets, deadlines, quotas drive us forward. Goals, objectives, plans keep us moving. And all for what? To be happier, richer, better off than our parents and in a position to leave our children better off than ourselves? And in all this haste, I fear that we are in danger of forgetting how to live. At the end of another manic week, I’m decidedly grateful that SB knew what I needed better than I knew myself. I’m glad that the child within me escaped for a a while and reminded me that there is a place in my life for whimsy. After all is said and done, to quote the man himself, I yam what I yam. For the first time in a long time I’m enjoying how I look. I still don’t have that hourglass figure I’ve craved for what seems like an eternity. I haven’t managed to grow a decent pair of ankles. And I have resigned myself to never, ever having legs that stretch to my earlobes. But as far as the face goes, I like what’s looking back at me when I get into the elevator to descend to the ground floor and have one last look in the mirror before I step out into the world. And no, I haven’t started wearing make-up but I have given the nod to a dash of lippie and the occasional swish of the mascara wand. I noticed the change earlier this year. Deep in conversation with a couple of Hungarian friends at Gozsdu Manó, one turned to me and commented that it was great to see how women my size seemed to enjoy life so much more. I ask you! Women my size? I’d long since grown accustomed to the refrain of ‘a woman your age should/shouldn’t do whatever’ but this size thing was a new one. I put it down to yet another morsel of wisdom that got lost somewhere in translation and I took it on the back of the sincerity with which it was delivered … I took it as a compliment. I had a brief flashback to my first visit to Budapest. It was unnaturally cold and I hadn’t packed anything with long sleeves. 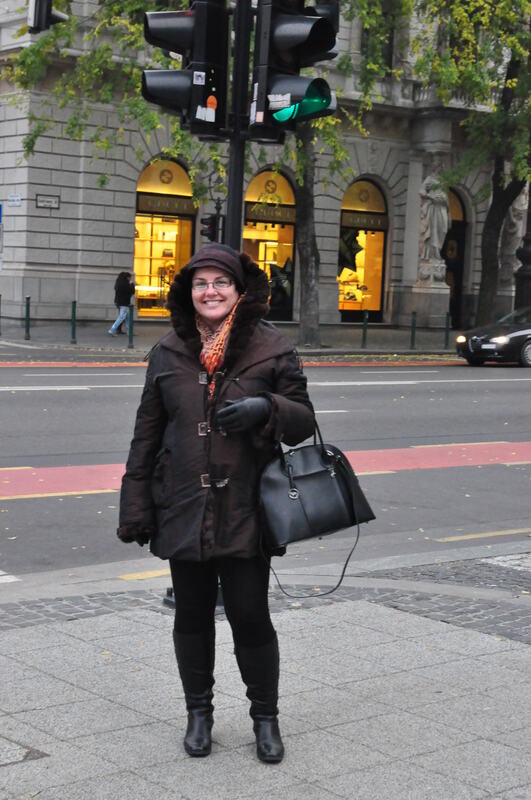 I went into a boutique on the Korut in search of something warm and woolly. My bright and breezy hello was greeted with a little disdain. The assistant looked me up and down and then pronounced with some authority that they didn’t stock anything in my size. And before you go off on a tangent about Hungarian customer service, this form of clothing commentary is not unique to Budapest. Rewind even further, to Los Angeles. In the dressing room of TJ Maxx, the ever-so-helpful assistant asked me if I was European. I smiled and asked whether it was my accent that had given me away. She laughed at my stupidity and said no… of course not. It’s just that while American’s tend to be fat in one place, Europeans tend to be fat all over! But these trifling comments on my size had been made by strangers and so were discounted. Granted, they’ve been milked for their amusement quotient over the years but they were never taken personally. In Bonn last weekend at the Toastmasters International District 59 Conference, I used the bones of this piece as the basis for a humorous speech. It ended up being too heavy on message and too light on humour and so didn’t make the final cut. But the judges liked how I smiled all the way through. Afterwards, a very pretty young girl in her mid-20s, stylishly dressed with a great figure, came up to me and offered to trade her size for my self-esteem. For once I was lost for words. And not for the first time, I cursed the society we have created, with its innate insecurities and impossible expectations. The opening lines from Maya Angelou’s poem, Phenomenal Woman came to mind: Pretty women wonder where my secret lies / I’m not cute or built to suit a fashion model’s size / But when I start to tell them, They think I’m telling lies. In Malta this week at DiploFoundation’s conference on Innovation in Diplomacy, two people complimented me on my moderation style – a little taken aback, I asked each of them to be more specific. Both independently said the same thing – smiles and energy. I started to wonder if the two are interlinked – whether smiles beget energy and vice versa. And I wondered some more about whether a mass-smiling campaign could help re-energise Hungary and unite the opposition. When people look at me and say with some element of surprise that I’m looking great, I can’t help wondering how I looked before. Or if they’ve not seen me for a while and the initial once-over takes a few seconds longer than usual, I can’t help wondering what they think is different. It must make me smile because they comment on that, too. There’s a curious sense of peace that comes with accepting who I am and what I look like. There’s a wonderful sense of release that comes with giving up the fight against nature and simply making the best of what she’s dealt me. And there’s a lovely sense of calm that comes with finally realising that anonymous got it right: pretty is something you’re born with, but beautiful … that’s an equal opportunity adjective. What would you do with a second-hand palace? When it came to wealth, I thought the Habsburgs reigned supreme but apparently the Esterházy family topped them on the who’s richest list of the day. If you visit northwestern Hungary, you’ll find yourself tripping over the Esterházy name. 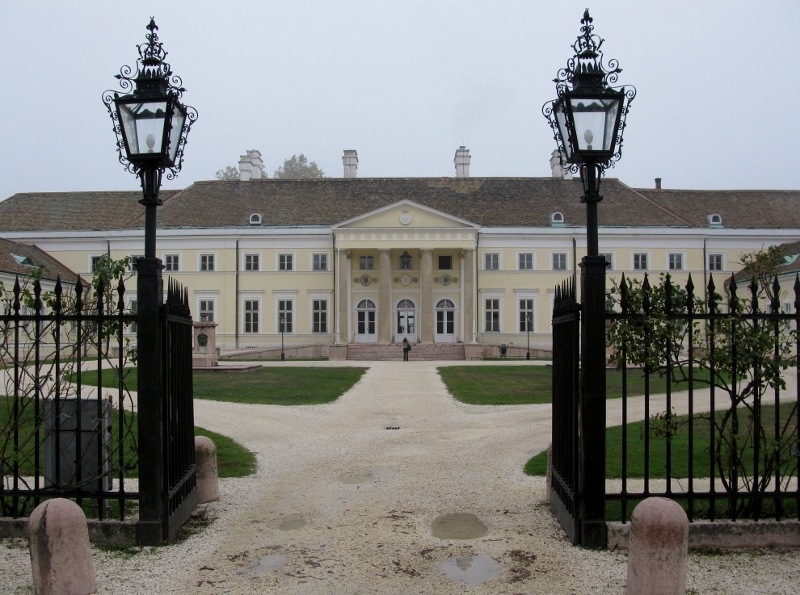 It seems as if any building worth noting in the region was once part of their estate: the hermitage at Majkpustas; the castle at Csesznek; the palace at Csákvár. From what I gather, the family got this particular castle in 1629 and over the course of two generations, completely restored it and its surrounds. It looks like János was the one to settle into the place and make it his own. Back in its day, it featured a huge library, an art gallery, a hunter’s hall, and a riding school. And there’s no doubt in my mind that tucked away somewher was a ballroom. The one-time palace was passed down from generation to generation – resting with Móric János around 1917. He had three children: Marcell, Mátyás and Mónika but it was his two grandchildren that staked their claim to fame: the writer Péter and the footballer Márton. 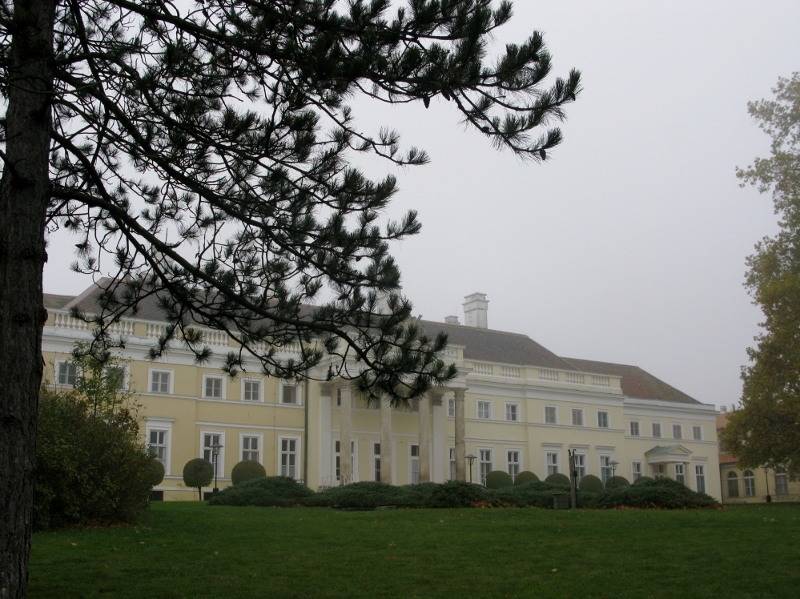 The family lived in the castle until 1944 when they escaped Hungary and settled in Austria. The castle was ravaged in the war years and renovations didn’t begin until 1957. It’s now a state-run sanatorium for pulmonary diseases (and I know this because???? I saw a sign inside saying pulmonary and one outside saying Florena szanatórium and one blog post I found confirmed it – nothing like a little Internet detecting). Although it’s a few stars short of a ‘come hither’ listing, it still retains its sense of grandeur and has been listed as a national monument since 1960. The ghosts of Elizabeth Bennett and her ilk stroll through the gardens and you could be forgiven for imagining the sound of horse-drawn carriages pulling up to the front door. The day wasn’t particularly fine – we’d been driving through mist and fog for most of the morning – but it didn’t take much to imagine the place in the height of the summer. Not knowing that we were supposed dto check at the porter’s gate to arrange a tour, we simply wandered in. No one asked what we were doing. We met a couple of residents in wheelchairs and a few who looked as if they didn’t quite belong. Sans cameras, these I took to be visitors, but unlike ourselves, had probably brought grapes. Apart from the woman busily closing down the buffet at 10am, I didn’t see anyone remotely resembling a doctor or a nurse and this made me wonder. It could have been one giant movie set. Try as I might to retain some sense of perspective and keep my already tenuous grip in reality, images of Mr Darcy’s boots kept coming to mind. Perhaps a stay at a sanitorium is really what I need! https://unpackingmybottomdrawer.com/wp-content/uploads/2017/06/logo-300x82.png 0 0 Mary Murphy https://unpackingmybottomdrawer.com/wp-content/uploads/2017/06/logo-300x82.png Mary Murphy2012-11-21 08:42:302016-08-10 11:42:13What would you do with a second-hand palace? Golfers everywhere refer to the clubhouse as the 19th hole. The last place of refuge. A place to celebrate their victories or drown their sorrows. Back in the day, when I was no stranger to fairways and bunkers and talked animatedly about birdies and eagles, I, too, enjoyed a tipple and the accompanying reflection at the 19th. 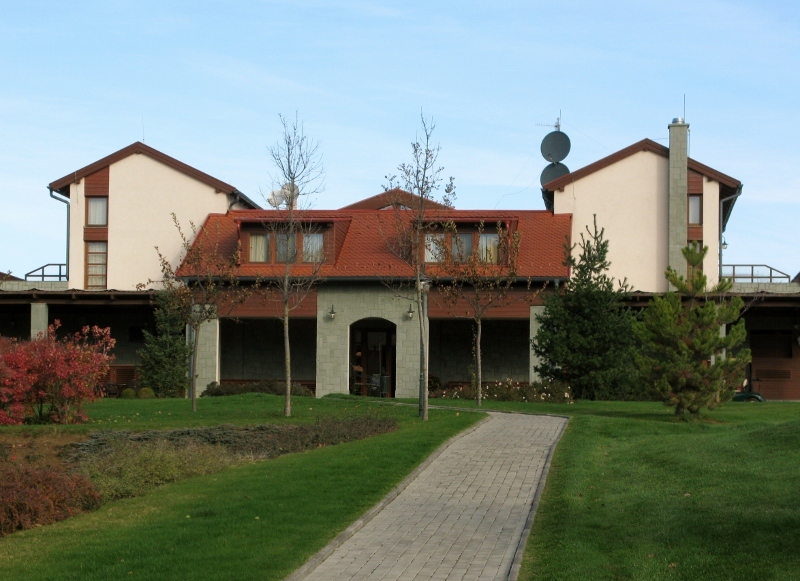 On a roadtrip recently through northwestern Hungary, we’d booked ourselves in for a night at the Forest Hills Golf and Country Club. While the English translation of the website leaves a lot to be desired, I caught the essence of what was on offer and for once didn’t cross it off my list of options because no one took the trouble to check the grammar [and you know how difficult that was for me….]. That it was a reasonable €65 pn B&B wasn’t the deciding factor either. What swayed me was the fact that it had its own chapel in the grounds. This I had to see. I had visions of golfers invoking the protection of St Andrew, the patron saint of golf, before teeing off, perhaps even asking him to favour them over their matchplay opponent or praying that their mixed partner would be on form. The idea of providing a pit-stop for prayer before the first tee or after the last green had me completely intrigued. The history of the place (or what I could glean from the website) dates back to the post-war years when the owner moved from Budapest to the nearby village of Bakonyjákó. 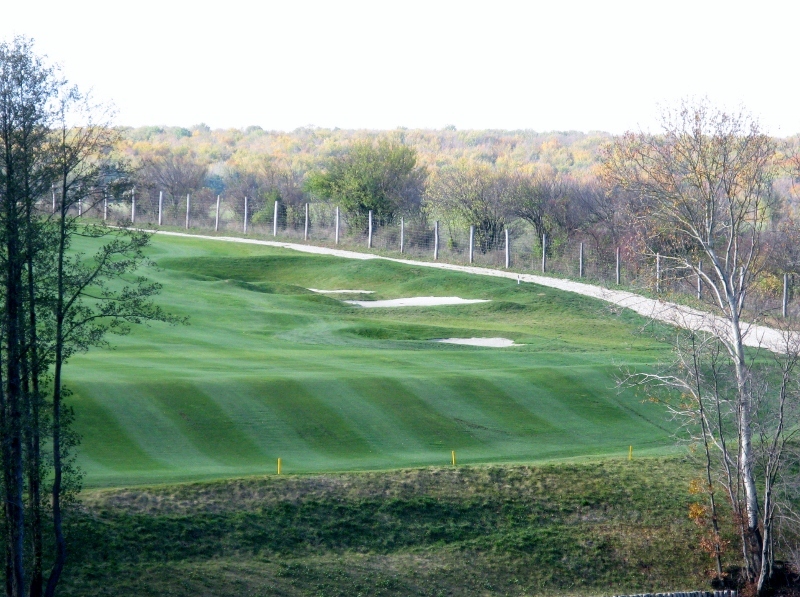 Building a golf course was a dream project… one he made come true. Kudos due for that alone. The chapel itself is tiny – but does the business. It was built to commemorate the birth of his son and stands in the grounds near the clubhouse. I’d had visions of a restored ruin so although it wasn’t quite what I’d expected, I’m glad we made the choice we did. 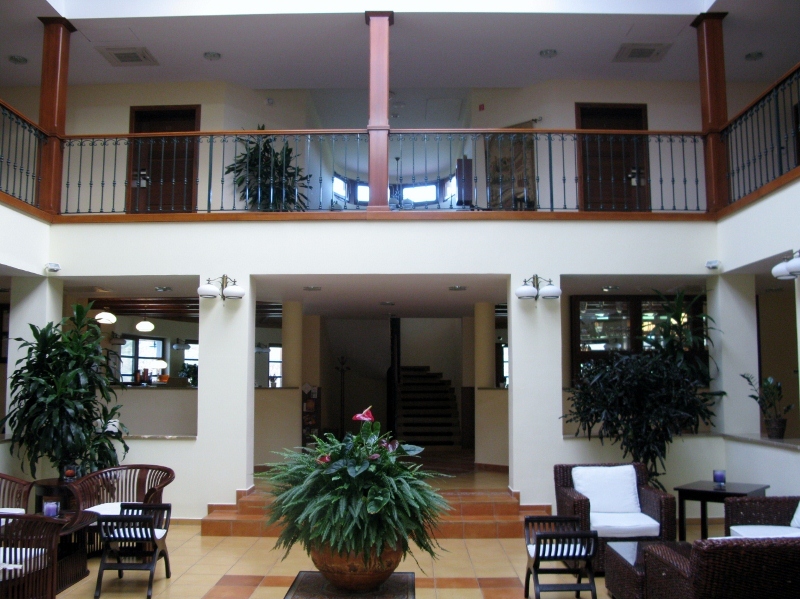 The staff were lovely – I felt completely at home and would happily have stayed a week. They’ve managed – one and all – to hit on just the right amount of attention and are very much on the ball. The food was excellent. It even inspired me to add gnocchi to my culinary repertoire. I counted six others at breakfast; it wasn’t a packed weekend. But apparently the weekend before had been booked solid. Were I asked to make a suggestion or two or two for improvement – I’d add some English-language books to the library and do something to improve the WiFi connection. Minor really. 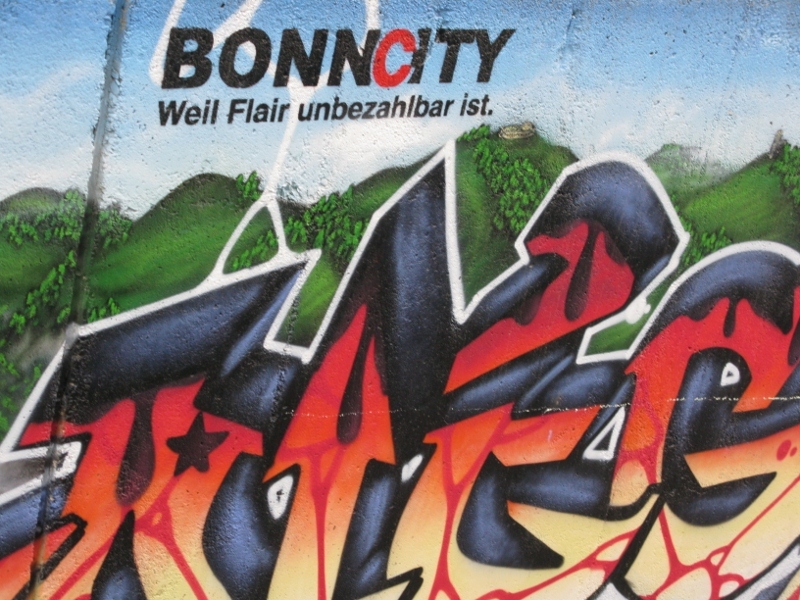 There’s plenty to do and it’s a great base for seeing the likes of Zirc and Pannonhalma. If you’re in the neighbourhood, drop by. https://unpackingmybottomdrawer.com/wp-content/uploads/2017/06/logo-300x82.png 0 0 Mary Murphy https://unpackingmybottomdrawer.com/wp-content/uploads/2017/06/logo-300x82.png Mary Murphy2012-11-19 08:55:482016-08-10 11:42:14The new 19th? Earlier today, in Bonn, Germany, I gave a two-minute impromptu speech entitled: One of my most treasured memories. It was a competition speech. Thirteen other speakers from District 59 (Continental Europe) of Toastmasters International also spoke on the same subject. It’s the fall conference. I drew slot 5 so I got to hear 9 others deliver their take. The results will be announced later tonight at the gala dinner. I spoke well. I felt well. And I was surprised at how emotional I was. Afterwards, random strangers (although all Toastmasters themselves) came up to me and gave me feedback. They told me that I’d touched something in them, that I’d hit a chord, that my speech had resonated at some level. Former District Champions and other professional speakers complimented me on my performance. One man told me that I’d brought tears to his eyes. I’ll admit to being a little cynical at first – a little taken aback by the cultish nature of it all (I have no clue what’s going on in the outside world, of what I’ve missed, so tightly cocooned are we in this world of stage and speech.) But on closer examination, the sincerity, the genuine concern and drive to help others improve far outstrips that. I realised that it’s not the winning that matters – although it would be nice to be on the podium this evening. It’s not the applause or the accolades or the judges’ decision. Speaking – motivational, inspirational or even humorous speaking – is about connecting with your audience, reaching a part of them that perhaps they didn’t know about or had forgotten. It’s been a manic 48 hours. Being with 299 other people who are passionate about public speaking is new to me. To hear their feedback and to see how willing they are to share their thoughts and help others improve is moving. The sense of goodwill, of appreciation, of generous acknowledgment, is inspiring. 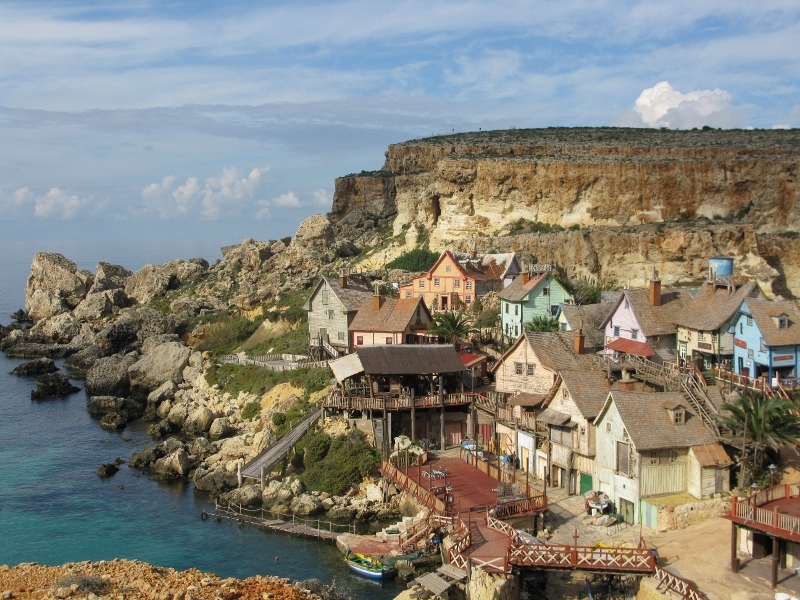 Budapest won its bid to host the 2013 District 59 conference next November. It will be a momentus occasion. An opportunity to see how shared goals, mutual objectives, and common passions can enrich the world – even if it is just a small part of the world at large. At the end of what has been a mad, crazy week, and at the start of one that promises to be equally manic and crazy, I’m grateful that I’ve had the opportunity to touch people, to connect with them, and to indulge a passion. Before it became a Camaldulian heritage, the monastery at Majk was a Premonstratensian provostry. And yes, I had to check the dictionary. Twice. Once to see what a Premonstratensian provostry was and again to see who or what the Camaldulians were/are. 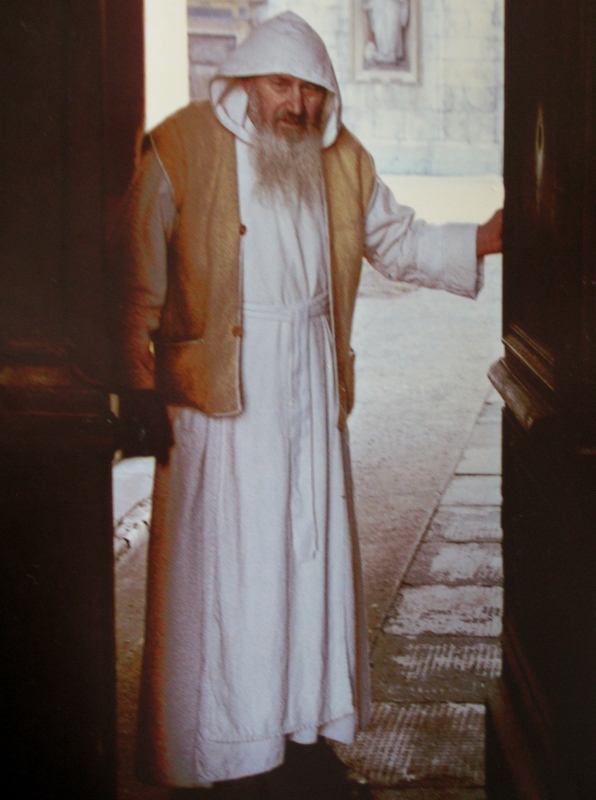 The former is a priory that followed the teachings of St Norbert at Prémontré, near Laon, Île de France, c1120 (also called Premonstrants, Norbertines, and, from the colour of their habit, White Canons).The latter are bald, bearded monks in white robes that follow the teachings of St Benedict and take vows of silence. 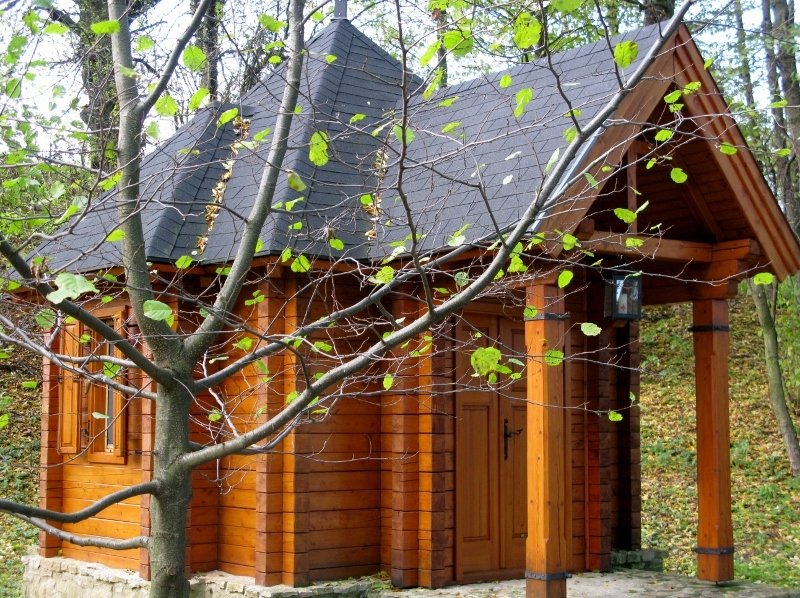 Situated in the northern part of the Vértes Mountains (NW Hungary) the hermitage was originally built in the twelfth century and was significant for its notarial functions – the monks were authorised to issue deeds and wills. When the Turks arrived, the monks left, and the monastery was subsumed into the Tata Castle estate. 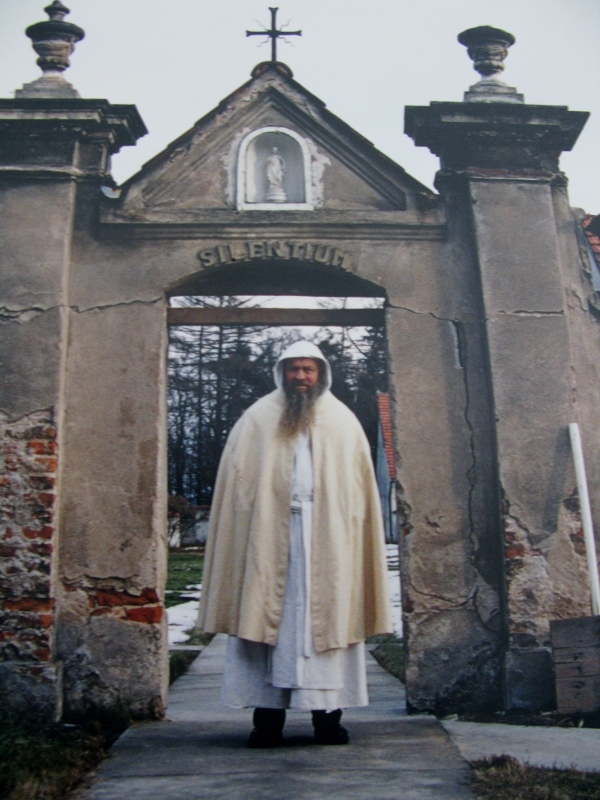 When Count József Eszterházybought Tata and all the surrounding villages, he also got the monastery, and having little need for it, gave it over to the Camaldulian Order who arrived in Majk at the turn of the century. The Camaldolese were established by an Italian monk by the name of Romauld around the begnning of the second millennium. 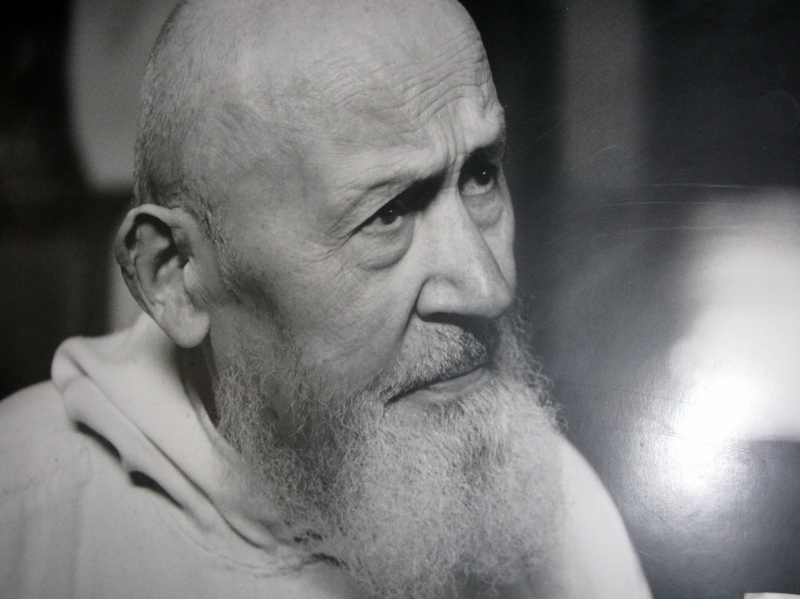 A student of the teachings of St Benedict, Romauld wanted to mix the eremetical tradition of monastic life with that of the cenobium, in other words, living as a hermit while living in a community. The mind boggles. Construction lasted from 1733 to 1770. Each of the 17 houses was sponsored by an aristocratic family and took two years to build. 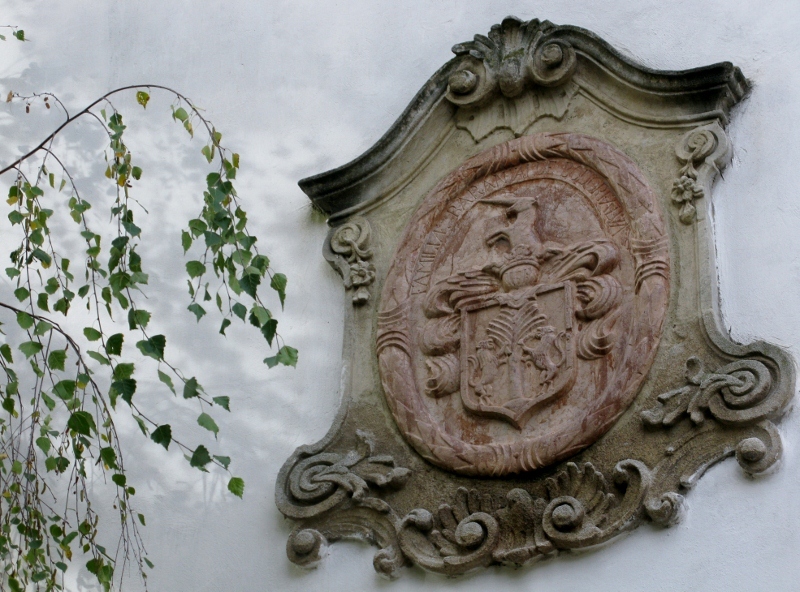 The family crest on the outer wall makes it easy to identify the patrons… if you’re up on your crests, that is. Each house (80 square metres) has five rooms – a living room, a private chapel, a workshop, a pantry and a kitchen. Stairs lead up to the attic and down to the cellar. The 17 monks took vows of silence and twice a year, at Christmas and Easter, could join the rest of the community in the refectory and talk three times a day for three days… this must be when the eremetical tradition of monastic life [met] with that of the cenobium. Of course, it could also be that the houses are laid out as in a village, surrounded by a stone wall, with the church in the centre. 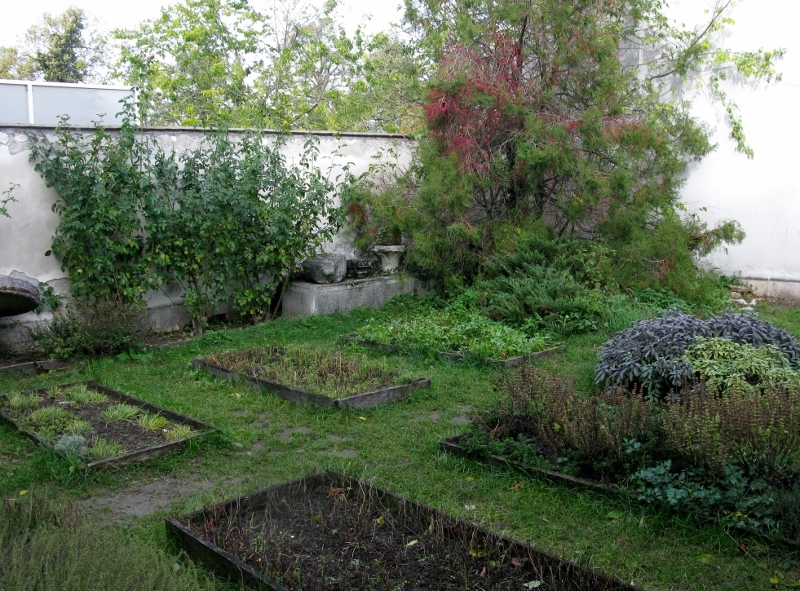 The monks worked their gardens, growing vegetables, fruit, herbs and medicinal plants, which were processed at the monastery’s pharmacy. The rest of their time was spent praying and making intercessions on behalf of their patrons. Before a monk could be housed, he had to spend three years in training – on probation as it were. Once he made the cut, he took the vow of silence. Those who didn’t make the cut continued to serve as lay people in the wider monastic community. 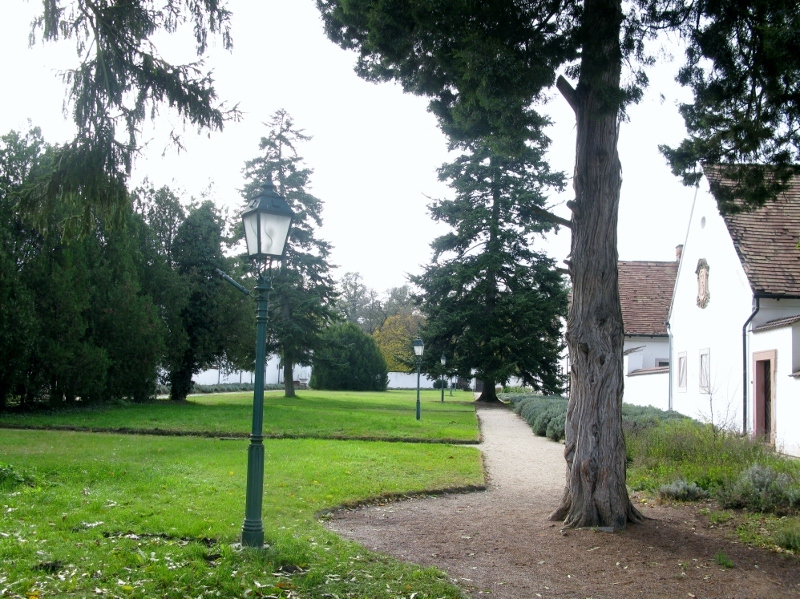 It is a truly lovely place and well worth a visit if you find yourself in the neighbourhood of Majkpuszta, near Oroszlány, in Komárom-Esztergom county. The monks have long gone [photos here are photos of photos and could even be from a similar monastery in Poland… can’t rightly remember]. What with the monks being silent and so not doing any useful work like nursing the sick or educating the poor, Emperor Joseph II, one of Europe’s enlightened despots, had the order dissolved. Back once again in the Eszterházy family, this time it was Móric who found a use for it, converting it to a hunting lodge. After the Second World War, it was used to house the miners from the nearby mine. Now it’s a museum… testament to a life once lived. The price of Herend porcelain has, on occasion, caused to me to clutch my heart and fear death. You couldn’t pay me enough money to put some of the patterns on my table; and for others, I’d willing paying a King’s ransom… were I married to one. This was my first time to visit the factory and see for myself why it costs so much… and I’m suitable chastened. There are whole families employed at the factory, many of whom have worked nowhere else. In a world of portfolio careers, in this town in northwestern Hungary jobs for life are still within reach. The company has been around for 180+ years and trains its workforce locally, with many training for three years before taking up position. 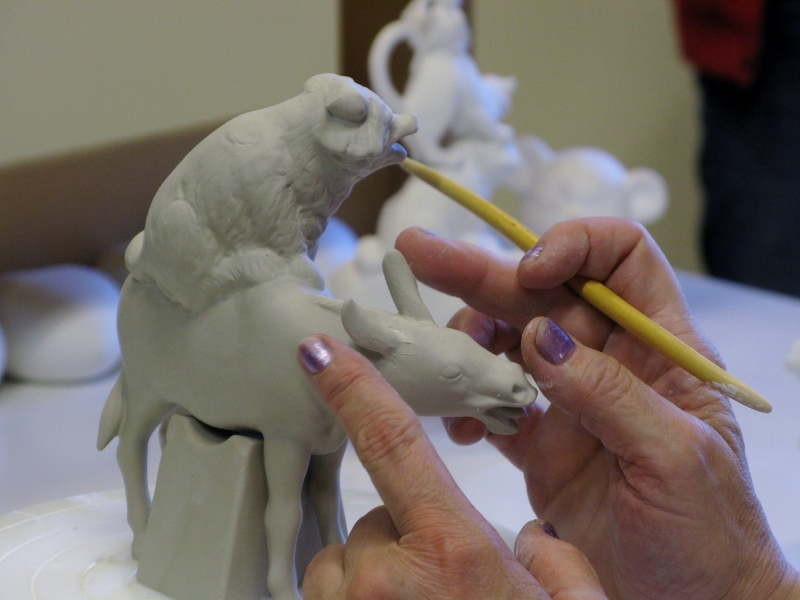 Many of the figurines are made piece by piece – literally. A separate mould for the donkey’s ear, the wolf’s chin, the bear’s nose. And at maximum output, figure on maybe two figurines a day, per artist. And, interesting piece of trivia – the ‘glue’ used is plain tap water. 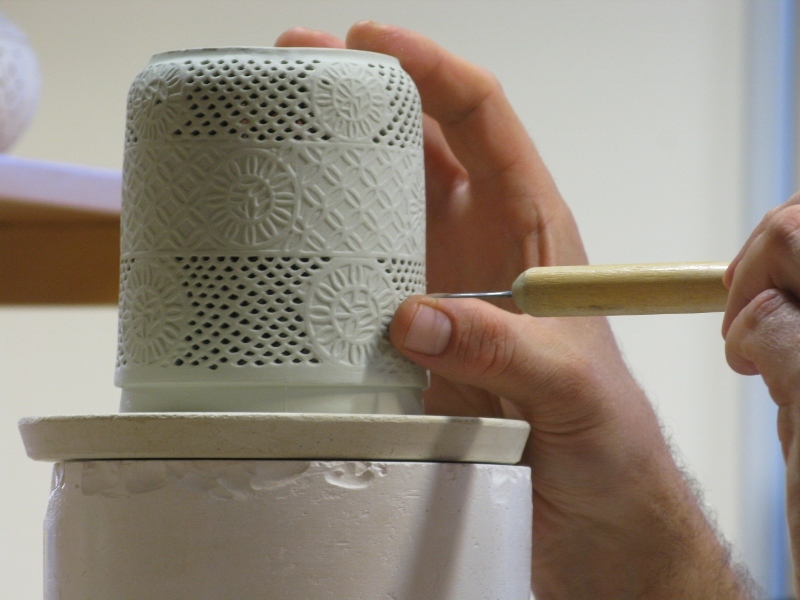 These porcelain baskets, by contrast, take about 20 minutes, once you get the hang of them. They start off green but within 7 days or so, dry out to a nice white. Trace it. Outline it. Bake it. Paint it. Bake it. You’d need the patience of Job for this. 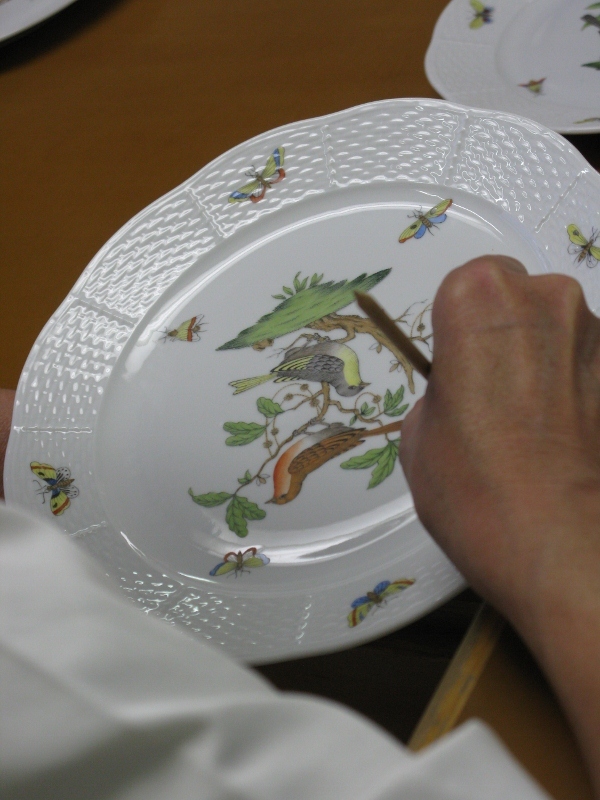 These particular hands have been painting in Herend for 43 years and are soon to retire. Respect. One plate can take up to 40 hours… a whole week. So, now that I know why it’s so expensive, I’m left wondering who buys the stuff? The Hungarian government gave William and Kate a full service for their Wedding last year. What a shame princes these days don’t use the personals…. I’ve managed to get myself into trouble on occasion but never anything so serious that I couldn’t be extricated, more or less intact. I still have all the organs with which I was born and have never, to my knowledge, undergone an operation. I did break my sacrum in a snowmachine accident in 1998 and memories of life at that time are coated in a morphine haze. Apart from the odd pain when I stand too long on concrete or sit too long anywhere or lie down for too long … in fact, as long as I keep moving, I’m grand. Had the break been a couple of centimeters higher, though, I might be telling a different story. 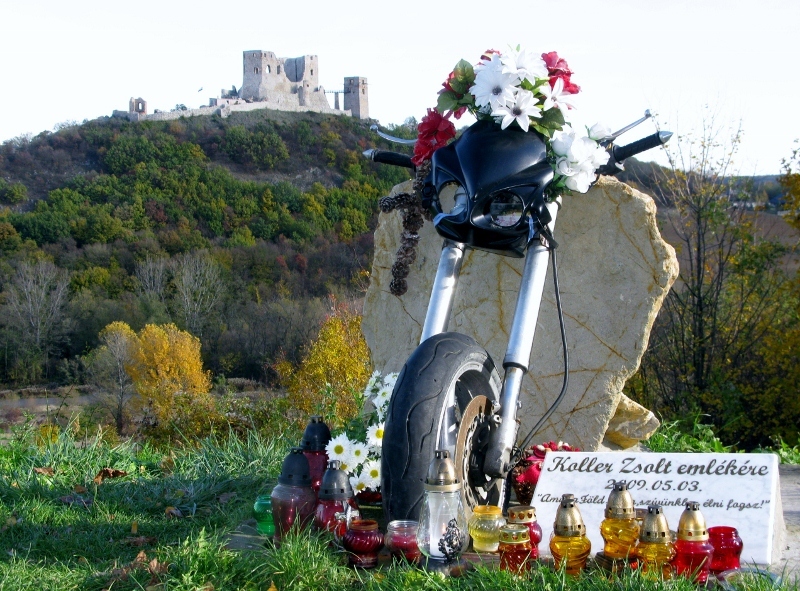 I was reminded of my mortality recently when driving the winding roads between Zirc and Pannonhalma (aka Highway 82), in Veszprém country in northwestern Hungary. I passed underneath Csesznek castle and was suitably awed. 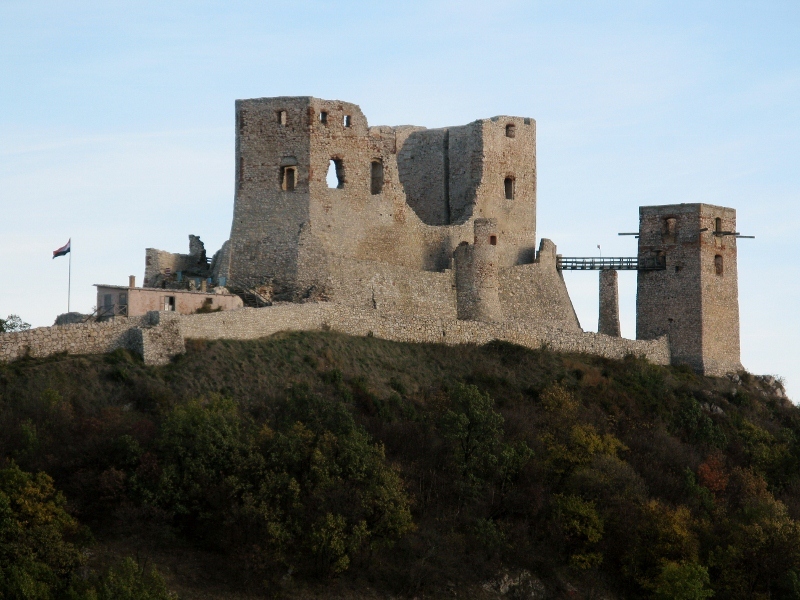 Built around 1263 AD soon after the Mongol invasion, it changed hands many times, housing the Habsburg troops in the early eighteenth century. The Turks captured it at one stage and then it was won back by Hungary. It managed to get through hundreds of years of conflict to be damaged by a force majeure – an earthquake – in 1810. Some time later, a fire caused by a lightning strike completely destroyed it. 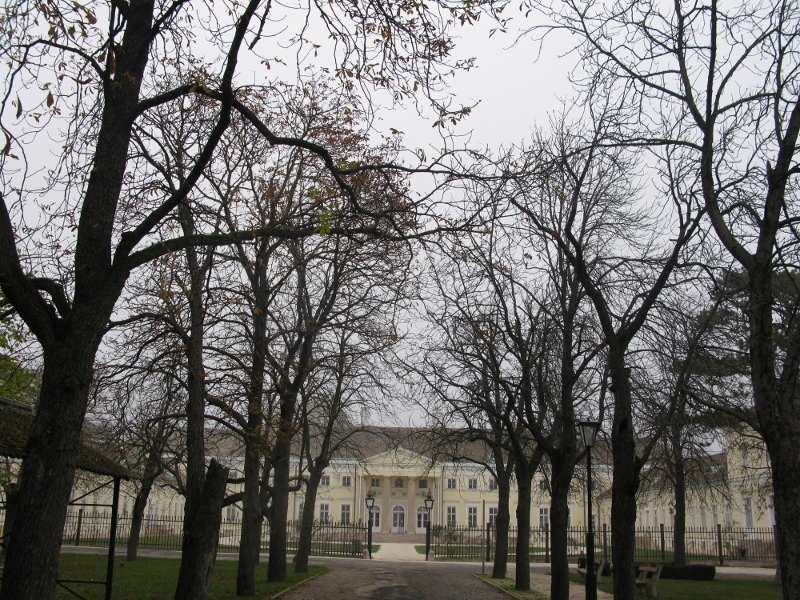 In 1635, Dániel Eszterházy bought the castle and village (nice to be able to think in such terms) and it remained part of the Ezsterházy estate until 1945. 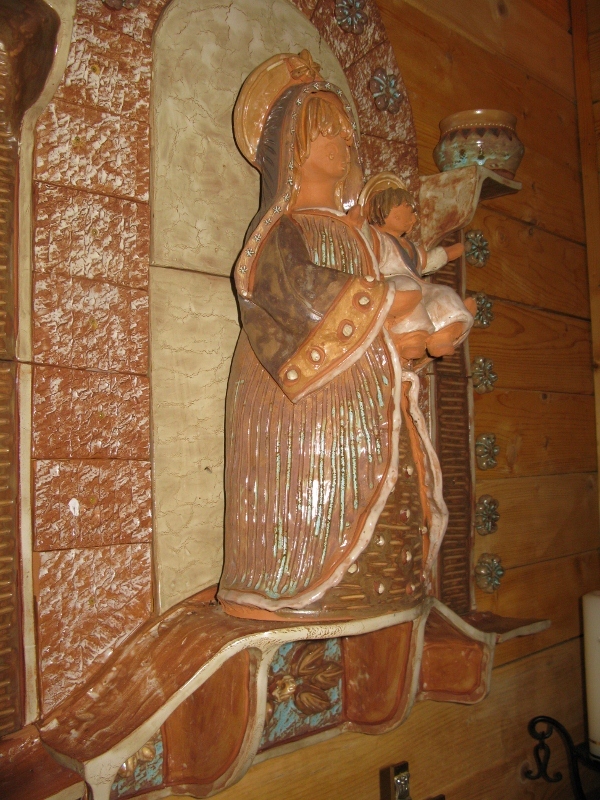 It’s been under excavation and restoration since 1967. One this sunny Sunday in November, I navigated the bends of Route 82 at speed, doing my best impression of Rosemary Smith (I was late for mass…) I love to drive and I love to drive on deserted, winding, country roads in a real car with a manual gearbox. It was an unseasonable 17 degrees and the radio station was playing hits from the 1980s. I was in heaven. Late or not, I had to stop to take a quick photo of the imposing castle. It was then that I noticed that someone else hadn’t been so lucky. 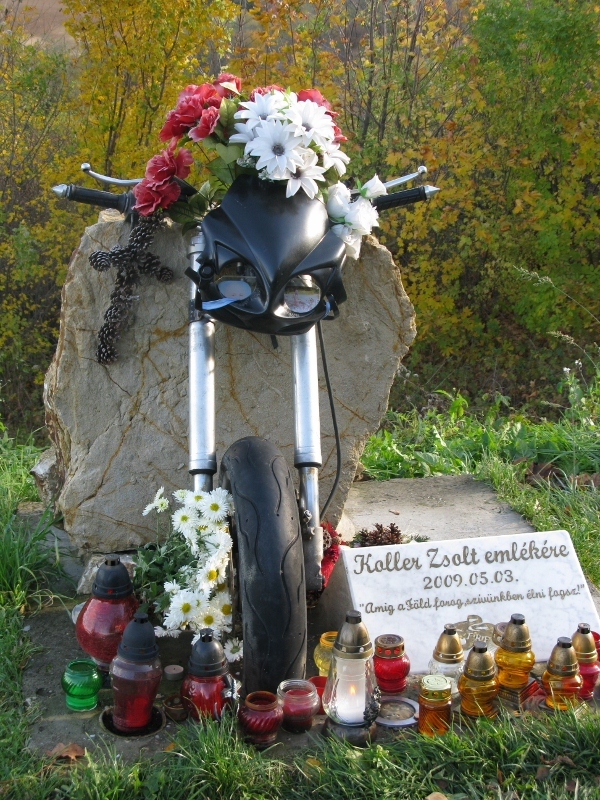 Losing a life, any life, to the roads, is a sad thing, especially when nine times of out ten, it could have been avoided. If I have done any deed worthy of remembrance, that deed will be my monument. If not, no monument can preserve my memory. I wonder how right Agesilaus II was. I think of how statues are torn down, destroyed or relocated on the whim of political or national fervour. I see neglected graves in cemeteries everywhere, no-one left to remember or to care. And I wonder. This week, I’m inclined to be grateful that I made it to mass on time… and in one piece. While I doubt that given such a road again I’d drive more sedately, at least I might be a little more aware of the possible consequences. And I’ll certainly be giving more thought to legacies and good deeds.